My whole life I've wanted nothing more than to fit in. Only, my whole life I've done anything but. That's probably because I'm anything but average. After all--female serial killers seem to be a minority in today's society. And that's ok--because I've longed for a change for quite some time now. Which brings me back around to fitting in. You know what one has to do to fit in? I do. One has to blend. Which is great news! Because I realize my clock is ticking, so to speak, and now I want a family. Luckily, I've always been good at getting what I want. So I figure what better place to blend than suburbia? All that stuff I did before--it's water under the bridge now. I just hope it's not too late to change my ways. Here's to hoping for suburbia's sake, too. I mean, what are the odds I could be the girl next door? Apparently, they're better than you might think. What a fascinating story! 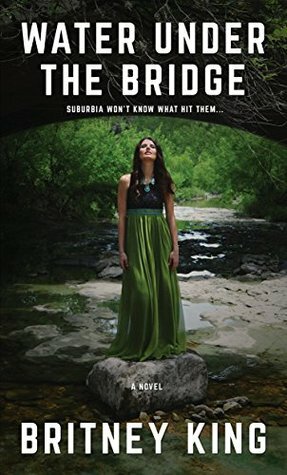 I was intrigued when I read the synopsis of this book and thought it could be pretty interesting, but I wasn't prepared for what I found between the pages. Water Under the Bridge is like Dexter x2 with romance. I was pulled in immediately and loved the writing style and back and forth between the characters. Kate and Jude are extremely unique characters. They are both serial killers attempting to find their place in the world among all of the bodies that they leave behind. Jude is a little more stable than Kate, who is messy and unstable. Each of the character's personalities leave you wondering what trouble they will get into next. I loved the atmosphere King created in Water Under the Bridge. I was constantly attempting to guess how the story would end and I wasn't even close! There were a few slow spots and pretty unbelievable scenarios, but for the most part I really enjoyed the story. I would recommend this book to those who enjoy psych thrillers. Check it out!